I'm a medium weight backpacker, meaning my pack usually weighs 30-35 lb (13-16 kg), and I generally hike a moderate pace and mostly in mountainous terrain. I almost always use a tent (lightweight when backpacking, wall tent when hunting). I'm a weekend backpacker and make lots of day trips and single night outings, plus a few week-long backpack trips. All of my outings have been in the beautiful and rugged Rocky Mountains of Colorado and Wyoming since I started backpacking in 2004. A couple notes on the above information. Firstly, there was an information card attached to the drybag I received that is erroneous. The label says "Large: Capacity 25 L/ Color: orange/ Weight: 75 grams," which is obviously not correct, except for the color. Fortunately, the Vargo website and the UPC label provided some better numbers. Secondly, I don't know how Vargo determines the volume of their drybags, but my guess is that it is based on usable volume. My "Calculated Volume" above was reached by using half the diameter (or radius) of the opening to find the area of the opening which is Pi*r^2 (Pi times radius squared) which is 3.14*8^2 = 201 in^2. Then multiplied that by the height, 201*33 = 6635 in^3 (cu in) or 109 L. Obviously, this 6635 cu in (109 L) would not all be usable, since there would be no way to roll the top down and buckle it. Before I even opened the shipping box I thought, "Wow, this thing is really lightweight." After opening it, my initial impression was even stronger that this drybag is extremely lightweight, especially for its size. At just over a 1/4 lb (134 g), it is impressively light. The fabric feels very much like the tent I purchased last year and the seams are similarly taped and sealed. 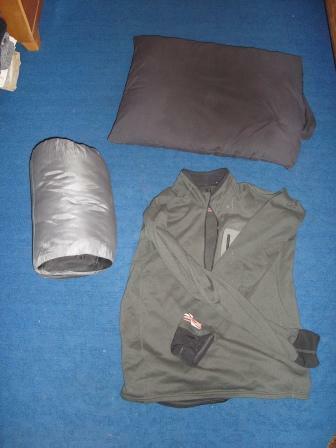 For an in-home test I put a sleeping bag, pillow, and shirt into the drybag along with an indicator strip (i.e. toilet paper). I then put the bag into the bathtub and turned the rain simulator (shower) on and let it run until there was a couple of inches (5 cm) of standing water. To make the test as difficult for the bag as possible, I made sure that the long seam on the 'back' of the bag was facing down, thus submerged, and left it sitting for an hour and a half. When I pulled it out of the tub, it didn't seem to have lost any of the air that had been squeezed inside, so it seems unlikely to me that any water could have gotten in. After removing the contents, it wasn't even so much as humid inside the bag. As an additional note, I could have easily fitted twice as much stuff into the bag and still have had room to roll the top down and buckle it. 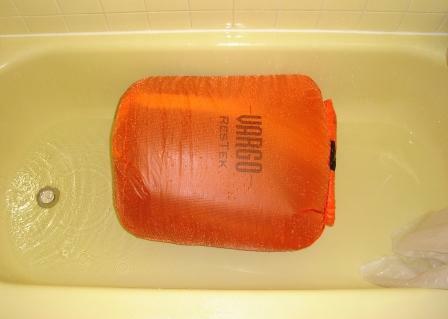 This featherweight drybag passed my rain and puddle simulation with flying colors. And with its enormous size, it is easily the largest drybag I have ever used. I'm looking forward to seeing whether or not it will remain impermeable after some hard use camping and (hopefully) whitewater rafting. This concludes my Initial Report. The Field Report will be amended to this report in approximately two months from the date of this report. Please check back then for further information. You might not think the dry mountains of the Western United States would be a great place to test a drybag, and normally you'd be right, but this Spring has brought more rain than normal and I've had good opportunities to get out and play in the rain. On the other hand, when the forecasts called for rain every weekend for the past two months, I didn't get out as often as I would have liked, but still got 2 good trips in to see how well this bag holds up. My first trip with the Restek drybag was to sunny Moab, Utah for a 3 night camping, hiking, and mountain biking trip. On the way there and back (about a 6 hour drive) the Restek drybag kept some of my essential gear (2 sleeping bags and 2 pillows) as dry as a bone even after getting lashed by rain at 75 mph (120 kph) for about 1/2 hour each way in the back of my truck. Unfortunately (fortunately? ), it didn't rain while we were in Utah, but the bag provided a sense of security knowing that our extra clothes or food, or whatever wouldn't fit in the tent with us, would be dry when we woke up in the morning. 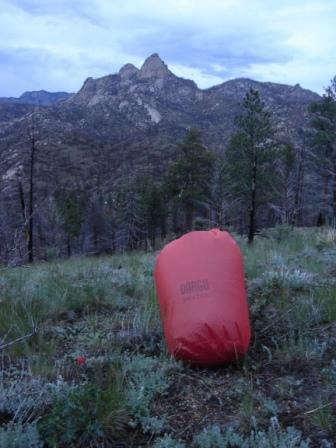 The second trip where the drybag came in very handy was on a 1 night backpacking trip with my family to Northrup Gulch in Pike National Forest. During the night, it rained sporadically (I wasn't awake most of the time so I don't have any exact measurements) and the extra clothes in the drybag were perfectly dry when I took them out the next morning. I think a little disclosure is necessary here. Since my wife's and my packs are both fully waterproof, we didn't really need the drybag, but it is so lightweight that I didn't feel overburdened bringing it with and I knew it would be a good opportunity to test it. Although I wouldn't call it torture testing, I have put the Restek Drybag through a couple common test cases (strapped into the back of the truck and sitting outside my tent). In both cases, the contents were kept dry and I believe the bag is still airtight (judging by the "puffiness" of the bag), not to mention waterproof. This concludes my Field Report. The Long Term Report will be amended to this report in approximately two months from the date of this report. Please check back then for further information. 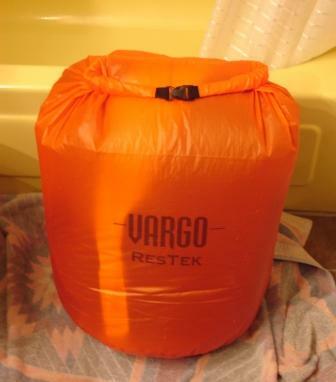 In the past two months I've taken the Vargo Restek Ultralight dry bag on two car camping trips, two backpacking trips, and best of all, a whitewater rafting trip through the Royal Gorge on the Arkansas River in southern Colorado. The Royal Gorge is 10 miles (16 km) of class III-IV rapids through a steep canyon with sheer walls up to 1,100 ft (330 m) high. Rafting it takes about three hours. On each of my camping trips, I was fortunate enough (unfortunate for testing a dry bag) not to have any significant precipitation, so the only real test was on the whitewater rafting trip. Since it was just an afternoon trip, all I had along to store in the bag was a change of clothes. Unfortunately, this required me to roll the top down much further than would normally be required with a fuller bag. 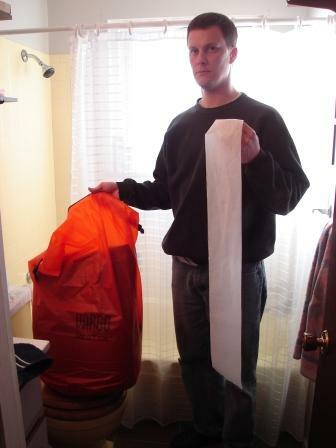 Even with the many rolls, the bag was not tight when I snapped it shut. In any case, at the end of the 10 miles (16 km) of rapids, my clothes inside the bag were the only things left dry in the raft. I could tell that water had seeped into several folds of the closure, but it did not make it into the main compartment. 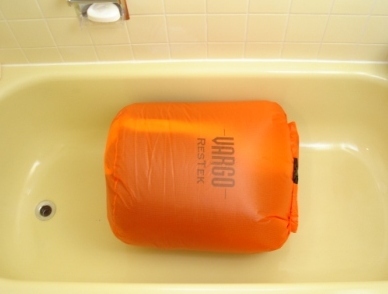 The Vargo Restek Ultralight dry bag kept my stuff dry in every case. It is very lightweight and easy to pack for the times when I need the extra storage space in camp, in the bed of the truck, or on the raft. I will use this dry bag on camping trips for as long as it lasts. 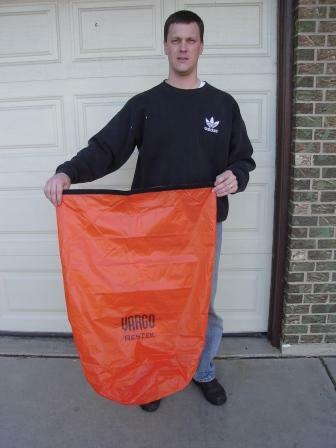 Its large size allows me to throw anything I need in and not have to worry about the weather.